Cornus controversa ‘June Snow-JFS’, introduced by J. Frank Schmidt & Son Inc., offers a unique look for a dogwood, with its multitude of tiny flowers that appear in the spring. 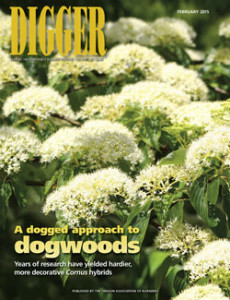 It is among the newer, disease-resistant selections that have revived the native dogwood in American gardens. Get the story behind the resurgence of native dogwoods in the February 2015 issue of Digger magazine. Hardier, more decorative Cornus hybrids are finding success with growers and landscapers, thanks to the pioneering work of researchers like Dr. Elwin Orton of Rutgers University.